It seems a bit overboard to wave around one's "genealogy" qualifications, but since some people take this a whole lot more serious than others, several of the genealogical organizations serving as standard-setters for the field state that all genealogists and family researchers should clearly list our qualifications as a means of letting the public know how qualified we are to be presenting the data, and therefore what level of trust may be placed in our particular set of work. I would like to state up front that I am not trying to represent myself as an expert. I was passed the mantle of family archivist from my parents who had collected a large amount of data from our expanded family (aunts, uncles, cousins, etc.) and who established communication bridges between our data and the work of several other Marcotte researchers in the U.S. and Canada. I have spent enough time doing this since 1971 that I must admit to moving beyond the realm of just a hobbyist, but it is certainly not something that I pursue as a career or for financial gain. My personal experience with professional genealogists so far has led me to believe that it is this financial gain criteria plus the amount of time per week spent that more sets me aside from the general ranks of professional researchers than is adherence to any particular set of standards practiced in terms of due diligence. My apologies if this page seems as ostentatious to you as it does to me. Feel free to think of this page as a "Blog," since it consists mostly of my opinions on the subject. I have a Bachelor’s Degree in French, and a minor in German. I have formally studied Italian, Russian, and Portuguese. I have informally studied Spanish and several other languages. I have worked in the military in Europe as a Department of Defense-certified linguist for both French and German, including representing the United States at a 1975 NATO-SOFA summit Germany dealing with the tax status of retired U.S. Military residing in the Federal Republic of Germany. I passed the Defense Department certification in German, but also in French, in 1973, both with the highest level for which I was eligible, prior to obtaining my French degree (1979), and without the benefit of any Defense Language Institute classes in French. (only the native language levels are higher, and I would have need to have been born in a French-speaking country or had a parent born there to be eligible for either of those levels). My grandparents spoke a French Canadian patois in their home with my father and his siblings, and I still remember them speaking it around me. My father taught my siblings and me French songs, phrases, prayers, vocabulary and idiomatic expressions even before I started school. While still in high school, I was offered and accepted a volunteer position by the Oklahoma State Department as an interpretor for a visiting trade delegation from the nation of Senegal, West Africa (whose official language is French). A proficiency in foreign languages allows a researcher to pick up on details and supporting evidence that might otherwise be missed or partially or entirely misinterpreted. It is obviously not the only skill a genealogist needs, but it is a very important one for researching ancestors from a country that uses a different language than one’s own. My other degrees (B.A., Economics and Masters in Business Administration) are relevant only in regard to the research, analytic and communications skills they bestowed while earning them. 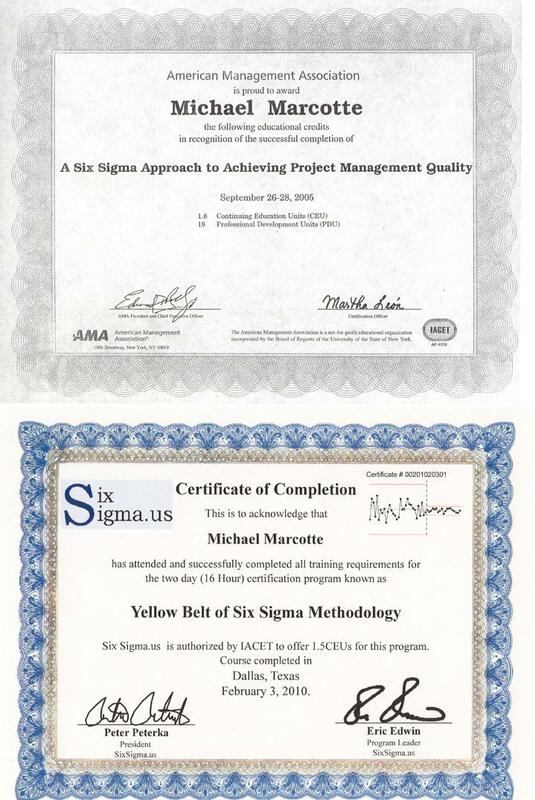 Professionally, throughout my career in information systems consulting and management I have also spent a lifetime studying, implementing and renewing project and systems methodologies (ex: Six Sigma Approach to Project Quality). While such methodologies are perhaps more typically thought of as relevant to the information technology or scientific realms, a system can be described as simply as any web of relationships among various entities or elements that combine to form a new whole\entity, (...which may possess properties not entirely attributable to specific constituent elements, etc., etc.) At any rate, a proficiency in such systems methodologies is therefore very helpful in collecting, analyzing, organizing and connecting such an array of related information as one finds in a genealogy. The French language degree and other language courses in college were also accompanied by various history courses and relevant topical discussions and research related to the culture and literature of France and surrounding nations, and relevant historical topics such as the Wars of Religions in France. I have personally spent actual research time in numerous genealogical libraries and centers and courthouse records on multiple occasions beginning in 1971, including but not limited to the Bibliothèque National in Paris, the Archive of the Hotel de Ville in Fécamp, Normandy, the Bibliothèque et Archives Nationales du Québec and the Archives of Ontario. I have also worked in other instances with residents of France and Canada who have done lookups at these and other locations for me. 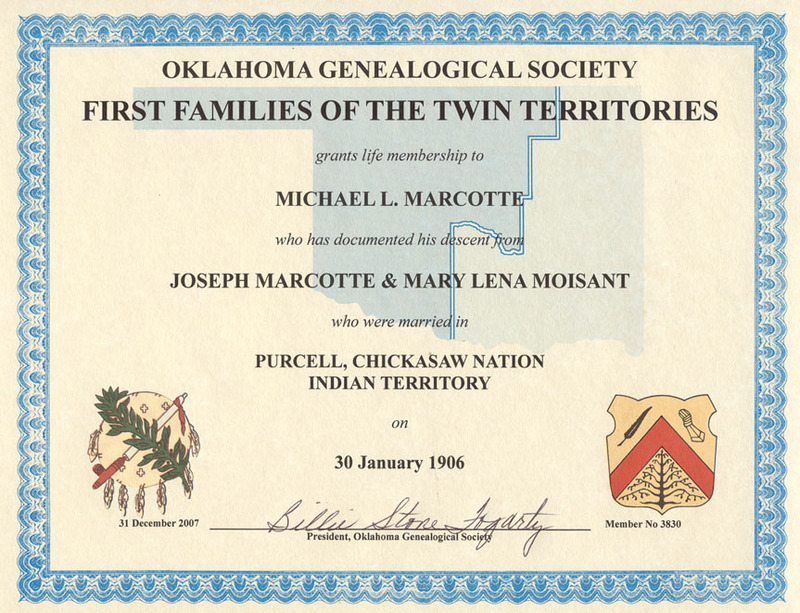 I am a member of the American-Canadian Genealogical Society, the Cleveland County Genealogical Society (Oklahoma), the Société généalogique canadienne-française (Montréal), the Association des Familles Marcotte, Inc.(based in Québec Province), and First Families of the Twin Territories. My preferred medium of publication of genealogy materials is to place them on-line, thus this website. I had a recent article, however, in the American-Canadian Genealogist, Journal, Issue #111, Vol. 33, 1st Quarter, 2007. Since that is now a back issue, I have placed the article on-line here: The Marcottage of Oklahoma: The French in the Land of the Red Man. In the military, the type work one performs is referred to as a Military Occupation Specialty (MOS). Mine was 95BV52LGMFR. The 2LGMFR portion meant I was a linguist in 2 languages: German and French. The 95V5 portion meant that I was a Military Police Investigator (MPI). Although my primary responsibilities were involved a daily use of my foreign languages (i.e. - working side by side with the local criminal police, customs officials, and Judicial or Finance Ministry officials), my preparation for the role also included completing the Army's military police training, and then the Investigator school and subsequent related training, followed by just over two years of investigative work at my duty station in Kaiserslautern. While criminal investigations are of course not particularly similar in nature to tracking down ancestors and primary source records, the use of both computers and paper trails to locate people and related information is certainly a skill that I that I have been able to apply in genealogical research. I have also found my subsequent work of three decades as a relational database designer and administrator to be somewhat uniquely useful in ferreting out obscurely-indexed information. Certification? No; I am not a “certified” genealogist, nor do I have current plans to become one. For persons who wish to make a living in this field or establish a professional reputation for him-\herself, I agree that it would be a very advisable and commendable thing to do. I have no plans to change occupations, and therefore certification\accreditation is neither appealing nor career-enhancing for me, although it may well be for others. This is one of many hobbies I have; that’s enough for me. Genealogy is not my life or my livelihood. For some people it is. ditorial perogative - Comments about certification, proof vs. truth, and "experts"
I must admit that while I possess a couple of minor certifications related to information technology, I have never found certification for my own profession or most others to be at all indicative of a person’s abilities, knowledge or post-certification adherence to standards. In fact, most of the true professionals I have worked with remain far too busy actually working and attending more job-specific training to take time out to pursue a general certification program that is continuously in a state of flux due to constantly evolving technology. The most certified people I have personally met have been those seeking jobs, not those already in jobs. Although certification in industries such as accounting are the driving force behind continuing professional education in a profession where the laws and interpretations of rules frequently change, the people who seem to benefit the most from many other such certifications are often the certifying institutions and vendors, not necessarily the public good or the end-user. A certified genealogist at least has had genealogy-related coursework, has been acquainted with the relevant ethical issues, and has been provided training on documentation and sourcing. He or she knows what is expected per the standards established by his\her particular certifying entity, but it is inevitable that some individuals are better suited to research work than others, some are more prone to jump to a conclusion, some are more fluent in the use of a relevant language than another, and so on. Just as you might unknowingly select an attorney with lesser oratory skills, research ability, zeal for your case, or just overall competence, so might you select a certified genealogist with better or worse skills than any number of others...and law school and the Bar exam are a lot more difficult than the certification process for professional genealogists. Ask for references, especially if you are being asked to pay for services. Search the internet for comments about the genealogist you are considering. But I'd caution against considering that certification is automatically equivalent to a higher level of research competence over some other researcher who hasn't elected to pursue certification. You may also discover that there are a few researchers who express a odd notion of exclusivity, i.e. - knowledge and access to any and all information fit to be shared. I believe that such a concept speaks for itself. As you expand your own research, you will, no doubt, find as have I that new primary documents are discovered almost every day. Genealogy is time-consuming, but hardly rocket science. Discoveries occur sometimes entirely by accident while on the trail of an entirely different ancestor. A baptism or other record may be found in a different parish, courthouse or other registry than the one expected. Also, even as a virtually unknown researcher, I have with simple planning, communication and local assistance, not found it particularly difficult to gain (supervised) review access to even very old and rare book collections, documentation and archives. Time and personal financial means have in my experience been as important factors in this respect as reputation. Since genealogy is for more people a hobby than a profession, and is practiced across thousands of municipalities, states, provinces and national boundaries there is not any single or even primary governing agency that controls professional genealogist certification, but several entities including universities, community colleges and independent organizations have established what many genealogists feel like is a reasonable number of standards, education requirements and a code of ethics for their profession. One of these entities, the Board for Certification of Genealogists (BCG) publishes a code of ethics that include the following for the “protection of the public.” These are steps that I try to apply uniformly. Where such is not the case, it is because I accepted something from another source as substantiated. Sometimes the substantiating sources are disputed. So basically there’s no winning, except to not list anything, and that’s not a winner either, so I list the data as under dispute. I will identify my sources for all information and cite only those I have personally used. (I list published sources as appropriately as possible; although sometimes collectively and versus on every page. Standards vary on this point, and a growing number of proponents advise that omitting one’s sources for living individuals decreases the probability of data being misappropriated for identity theft). I will quote sources precisely, avoiding any alterations that I do not clearly identify as editorial interpretations. ( No problem with this, unless the source I got it from turns out to not to be the original, which happens more often that I’d like, and is another good reason for this rule). I will present the purpose, practice, scope, and possibilities of genealogical research within a realistic framework. (Yes, I think I do. That does not mean that some of my "ancient genealogy" charts don't drift into the realm of mythology and legend; they certainly do, but I state that up front, and trust that those who use my pages understand the distinction between those pages and more current genealogies. ). I will delineate my abilities, publications, and/or fees in a true and realistic fashion. (that’s one of the reasons for this page). While these are great ethical ideals for researchers, and ones that I strive to personally embody, you can easily view flagrant violations of these or other standards (such as the “flaming” of other genealogists) in the remarks of several of today’s top professionals, historians and university professors just while browsing through a few of their websites and on-line groups\forums for genealogy, medieval history, book reviews, etc. That doesn’t mean you won’t find a page where I refute someone else's opinion or data; I just try not to get tacky about it. Proof is one of the bigger issues related to certification, and to a similar extent with one’s status among “professional” genealogists. Proof, however is often missing due to fires, floods, the fragile nature of paper documents and ultimately just the passage of time. While many theories about Native American or royal ancestors are presented as unproven, it is easy to find postings by experts that say that since such origins are speculative, they should not be presented on the internet, at all – while nearly in the same breath these experts will state that the same ancestor had European or common origin, fully knowing that no proof exist for that theory, either. Lack of proof NEVER constitutes proof of a reverse hypothesis in science, philosophy and certainly not in genealogy. Few "totally discredited" theories are truly "totally" discredited, despite the Ivy League PhD credentials of some who make such statements. Also, "discredited" does not have the same definition as "disproved," despite the tendency for some to treat the terms as synonymous. disprove: verb, prove to be false. Princeton's Wordnet site even includes a definition for the adjective discredited as "being unjustly brought into disrepute"
Truth is discredited every day, in every walk of life. In some ways, politics, law and recorded history make an art of this. Reputation and acclaim give no one, despite his or her stature, the right to “rule” upon a particular ancestry, based upon experience or what they feel to be “likely.” That’s not my opinion, that’s just me applying the above "professional" rule about speculative, unproven data. Everyone has every right to their opinion, but an opinion by an expert is still an opinion. You might well rely upon expert opinion in investing your savings in the stock market, but it is still called speculation. You might well rely upon expert opinion from a doctor, but few of us question the virtue of seeking a second opinion within the medical practice. Even when all the doctors, brokers, etc. are in agreement, almost everyone can cite examples of where reality and truth took a different course. Expertise is one of the easier routes to overconfidence and overstatement. Quoting the opinion of an expert does not qualify as irrefutable documentation. This is one of the big problems that today’s experts are having with yesterday’s experts. The quotation of “expert opinion” as the final word on a matter is to me a huge hypocrisy among person who consider themselves “certified” genealogists. Truth and proof are not synonyms. To quote the noted author, scholar/professor, minister and media commentator, Charles Kimball: “Demanding historical veracity as a prerequisite for truth is another kind of tunnel vision.” Dr. Kimball is a well-qualified expert on the subject of absolute truth claims, and may legitimately make such a statement, with which I agree one hundred+ percent. Does anyone, however, think this is the final word about proof? Hah! As best I can tell, many quite acclaimed genealogists had\have no particular educational background that more qualifies them than have many of the family genealogists (this is starting to evolve, as college programs offering associates degrees in family research and genealogy are cropping up with required course work in very relevant disciplines, such as foreign languages, history, library science and documentation). A PhD from Harvard, Yale or another prestigious university does not make a person an expert in every other field, nor even signify that the person did more than escape with a C-minus average. A visit to one or more on-line group forums where such illustrious professors and other academic types regularly dialogue can be most illuminating. If you examine any particular researcher’s background, you ought not to be too surprised to sense a predisposition to treat evidence according to one’s own demographic, social and educational experience. These do not always transfer seamlessly from one discipline to another. “Innocent until proven guilty” for example may be the law, but this is not a safe premise in physics or chemistry, nor is it a valid research standard for history or genealogy. To paraphrase Kelsey*, Laughery and other scholars, interpretation begins even before the interpreter reaches the text\details. A researcher is an interpreter (of data) and is rooted by his\her own “situatedness.”** You will observe my situatedness in my very choice of interpreter imagery and vocabulary. "However hard we may try to be objective, our ways of sorting and processing information...are necessarily conditioned by many factors. "**** I encourage you, however, to look closely at any claim of foremost or leading expertise to see whether such is bolstered by that persons specific academic background, and not accept an opinion as a statement of fact – whether it is me expressing the opinion or anyone else. A claim that a hypothesis has been discredited by some better-known "expert" does not automatically mean that it has been disproven, or that the dis-repudiation is academically or scientifically deserved. I inherited a substantial body of genealogy work from parents and other family. I’ve been working on these genealogies over 40 years, since my first trip to Europe in 1971. That neither makes me an expert nor guarantees accuracy. Neither does it make an expert of anyone else. Proof is in the product. A huge part of the attraction to genealogy for most is the speculation about possible famous or infamous ancestors and the on-going discovery process. 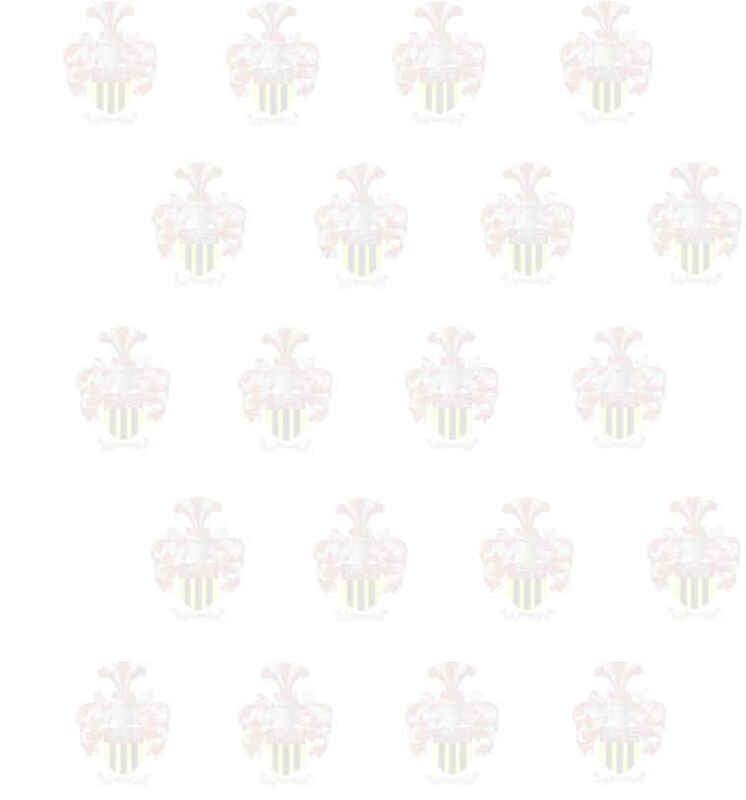 For a few more specific comments on speculation, famous genealogies and accuracy - Click here. Like history, there is, as one colleague put it, all too often no such thing as a "final word" in genealogy. If we were to remove the fun and speculative parts of genealogy, then paid researchers and professional researchers might well find that there was a dramatic reduction in the call for their services. As far as I am concerned, if someone can provide new insights about whether a speculative ancestry is right or wrong, let them. If you are convinced a lineage is wrong, then prove it. That is what many of those with disputed ancestors are now doing through DNA testing. If a lineage is speculative – by all means please mark it as such, but don’t chastise me or anyone else for doing it this way. Displaying and discussing a theory, then publishing and continuously testing and refining evidence is the only way that new knowledge ever emerges. Repression of alternative views, rote memorization and repetition of old knowledge never did anything more than provide an elementary education and creates closed-mindedness and stagnancy. In the "Digital Age," we are see a plethora of genealogies on the Web, some better than others, and few - including my own - constructed with the same level of source support or extensive on-site or primary source research as that performed by such researchers as Rene Jetté, John DuLong, Yves Gagné and others. Because of this, some researchers have directed heavy criticism at the Internet proliferation of such sites. As someone who found the Internet invaluable in locating not only missing names, but also copies of marriage certificates, photos, and baptismal and other registries stretching back to the 1500s for several of my direct ancestors, I must therefore at least in part disagree. Certainly there is chaff among the wheat, but even those who criticize the chaff have employed the same Internet mechanisms to publicize and correct such errors or faulty lineages. The medium used is not the problem. The digital medium has simply made it easier for more people to get involved. While that may indeed have increased the propagation of spurious lineages, anyone who fails to recognize that it has simultaneously elevated the research and collaborative abilities for a far greater percentage of people is simply in denial. More people may be repeating errors, but far, far more are being exposed to those same errors, thus increasing the likelihood that they will be corrected rather than being passed along to the next generation. The public Internet as we know it is not yet twenty years old. It can easily take that long for many a professional researcher to get his or her printed compilation in order, too. You may also wish to read my 2001 article on digital publishing. At the April 2007 NTEN (Non-Profit Technology Enterprise Network) Conference in Washington D.C., David Weinberger, co-author of the Cluetrain Manifesto presented the keynote address. In his remarks, Weiberger said "The embrace of fallibility is the most important thing happening on the Web”. He cited as a specific example Wikipedia, an ever-growing on-line encyclopedia composed entirely from user-contributed data (including a significant amount of genealogy). Weinberger praised Wikipedia for their willingness to flag inaccurate pages with warnings and offer an option to post to a discussion about the accuracy. He said this makes Wikipedia "more reliable," not less reliable as many influential critics would claim. Contrast this against our primary news source in the Western world. Does anyone believe the total accuracy and objectivity of such media giants as Fox News, CNN or the Washington Post, for example? Journalistic principles notwithstanding, you'd have to be extremely naive to think that any such large news source is going to label their output with the same candid admission of potential fallibility and\or need for additional verification. Can you see the same reliability disclaimers being published along with the articles or even editorials in even your hometown newspaper? Of course not. Yet we know that journalists, genealogists, researchers, and even historians are human. We all make mistakes, and we all exercise some level of subjectivity. Putting something in the public domain places it in full view of all the critics. Our errors are exposed and are (hopefully) corrected. It is as important to learn, teach and consider what is NOT, as it is to learn, teach and consider what IS. Creativity and the growth of a body of knowledge are the fruits of the UNKNOWN. (paraphrased from a Zen saying). **- “The Theological Use of Scripture in Process Hermeneutics,” by David Kelsey, Luther A. Weigle Professor of Theology at Yale University.